The winner of the "Cornerstone Flies" is "SAVAGE" of Outdoor Savages. Please contact me at uppahdam@aol.com and give me your mailing address. 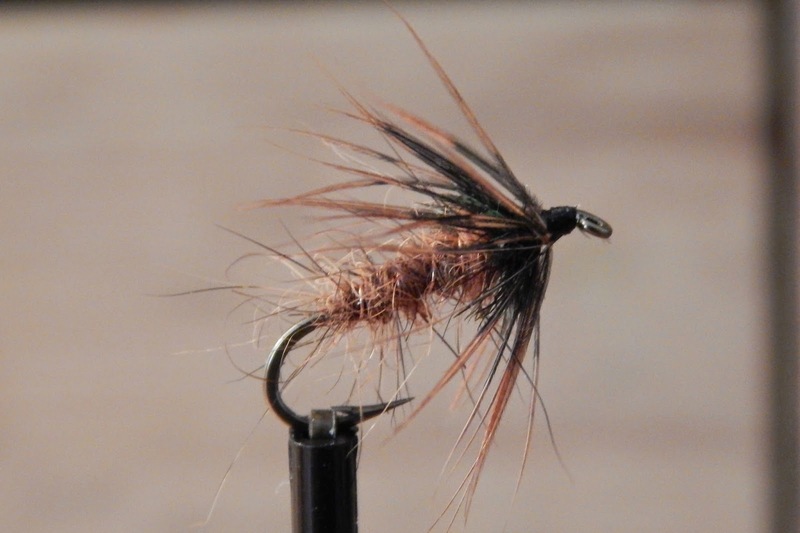 For the last several weeks I have been tying soft hackle wet flies. Been tying them with silk bodies, floss bodies, and various dubbed bodies. Many different feathers have been used for the hackle and these have a real fish catching look. So Friday I grabbed a box of them and headed to a nice little stream. This stream has some awesome hemlock trees to protect it, and one hazard of these trees is the tiny dry branches. They tend to dry and while sneaking about them one has the pleasure of these twigs falling down your back. It's truly amazing how a quarter inch twig can be so annoying. The first pool I fished I was able to coax a fish to strike. I continued to fish for some time before I had a hookup. The brookie managed to free itself before I could take a photo. I fished several different patterns and found they had taking a liking to the flies with colored silk bodies. In the flat just beyond the plunge pool a nice fish struck just as the fly was drawn to the surface. Moments later I had my first brookie at hand. A beautiful little jewel. This time of year can be difficult to sneak up on a pool to fish. The trees have yet to put leaves on, the water is so clear, so an angler must use the long line approach in order to get a fish to hit the fly. But when things come together the angler is rewarded with wild beauty. As the day turned to afternoon and my time to leave was close. I fished a few runs and managed to take another trout or two. Today I reached a milestone in my attempt to bring some of my ramblings, thoughts and memories to those who enjoy all that is small stream fly fishing. When Small Stream Reflections started I never anticipated it going this long, or reaching as many people as it has. I do truly enjoy bringing my thoughts and outings to you, but it's you my followers and readers from all over the world that deserve credit. It's hard to believe that this is my 700th post, but it is. And I have reached 415,000 page views, that's almost a half million. This is humbling, and appreciated. So to thank you I'm giving away 6 flies tied by me. These are what I call "Cornerstone Flies". Anyone who comments on this post is eligible to win. I will give each comment a number and place that number in a bowl. On Tuesday I will have my wife Jeanette reach into that bowl and pick a winning number. So I would like to say "thank you", and hope you'll continue to stop by "Small Stream Reflections"
Earth Day 2014 what better way to celebrate than to get out and do some stream exploration. I chose to visit a few streams that I have not fished since last year. I also took along a rod that has been in storage since early Autumn. The day was perfect, bright sunny skies, temps in the sixties, and not much wind. There were insects about but no risers. But the thought of fishing the dry was first on my mind and that's what took place. I tied a fly for this day built on the pattern of Don Gapen, later refined by Fran Betters in a mini version, and fine tuned by Mark to include a yellow wing. With that many variations how could my version be different. Well it is and I'll post the fly on a later post, but I'll tell you it's a mini-mini muddler. The 5 foot 2 weight Cabelas TQR, and the mini-mini muddler. This stream took a great deal of change since last I fished it. The stream path has completely changed. There were large blow downs, and massive wood jams. With that much surface change the bottom was also altered. It was like fishing a new stream, and The spots had to be located again. Such as this one, any stream with a undercut, with good flow and a nice bit of shade had to hold a trout....and it did. As the fly worked in the current the fish swirled and took. The battle started and the TQR was tested. 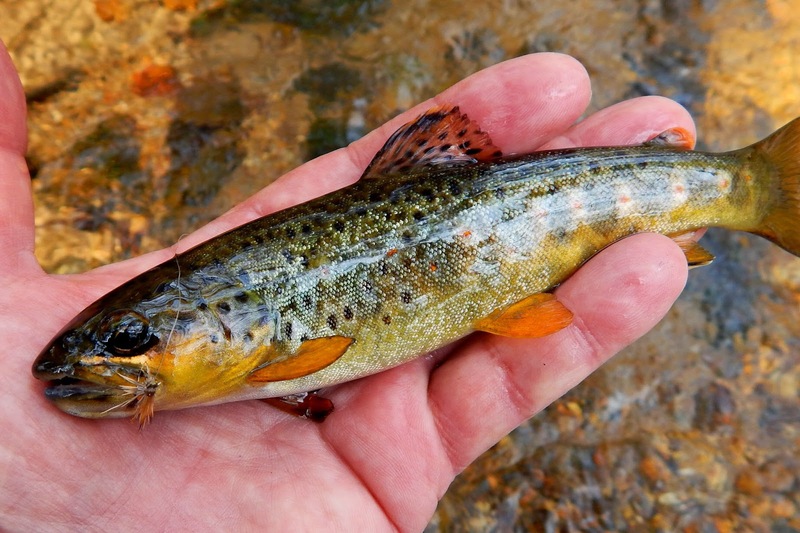 What was soon at my hand was a surprise, it was not a brookie but a wild brown. I can't remember catching one on this stream before, but it was welcomed. "Trout Lilies" a true sign of Spring. Theses are my first sightings, and in full bloom. Moving upstream the bug activity became intense. There were little flies all over, and even a rise or two. I tied on a "Bomber" and was rewarded with a nice brookie. Some more Spring flowers. These were delicate bright white flowers of which I don't know the name. Places like this get this anglers BP up a few notches, and for good reason. Pools, runs, pockets, a deep hole and overhead cover usually make for some interesting outcomes. I drifted the bomber and as the fly reached the shade a trout struck. The fish was on briefly but soon departed. Several more casts and again the fish struck. I don't know if it was the same one or not but it had to caught. I replaced the bomber with the mini-mini muddler and made a cast or two. As the fly drifted way towards the back of the bridge a fish hit. He put up a strong showing for himself using every bit of the pool to shake the fly. Moments later I slipped my hand under this fine fish. A wonderful way to spend some time on this Earth Day 2014. Saturday was the opening of Connecticut's inland fishing season. This meant that all the little streams, those tiny threads of sparkling water that most pass on by were open to fish again. I met Mark to fish one of these little gems. The stream had not been fished by us since mid January. Kirk soon followed, having to work for a while before he joined us. The weather was about as good as it gets this time of year, the stream was a bit low considering the rains of the week past. We split up and selected various parts of the stream where in many previous outings have proven productive. I fished for some time before I took my first strike. It came at an undercut and it came hard. But there was no hookup. This proved to be the norm for me until I was able to finely able to hook one in mid stream. My first fish of the day took a soft hackle wet fly. The brookie was a pretty as the last one I took here in January. As the day passed on we took a break and enjoyed coffee and muffins, with some talk of how we were going to fish the rest of our time. We then moved upstream. Kirk had to leave, but Mark and I forged on. The stream gave me the opportunity to bring a few more to hand. This one also showed a liking for the soft hackle. But I could see that a dry fly would be in the mix soon. Time was getting on and soon the decision was made to leave. It was a great day on this stream, the rewards plenty. As I left I thought I have about 20 minutes of fishing time before I was to be home. I decided to stop at another brook to take a few casts. This stream is just down the road from where we had fished. I tied on a dry fly, just dubbing and hackle and sent it bouncing in the current. Suddenly the trout rose and took a swipe at the fly. I pulled to set the hook but was to late. As I pulled the fly to me with the thought of another cast the trout hit the fly again. This time the fly found pay dirt. A wonderful ending to a great day. The dry fly season is here. 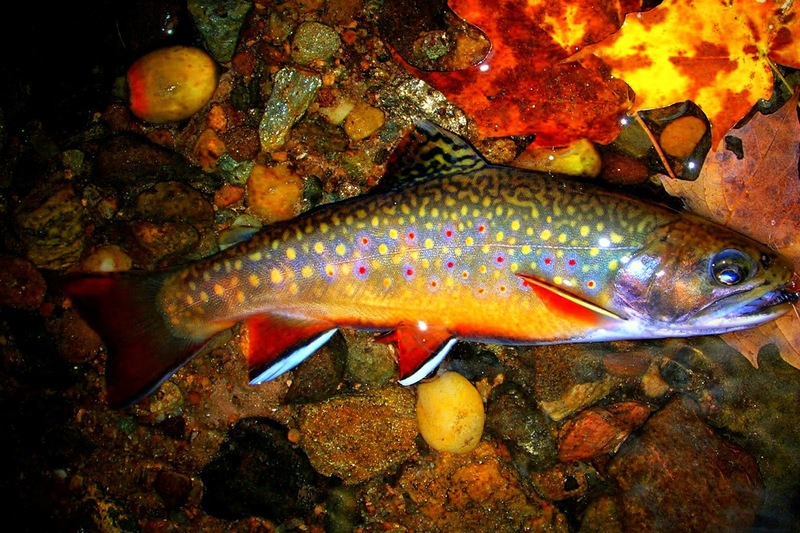 Brook trout are the most beautiful fish on the earth, "a cornerstone". They are found in the most pristine locations, and can be coaxed to take a multitude of flies. Some of these flies can be colorful attractors with a bit of flair and flash. 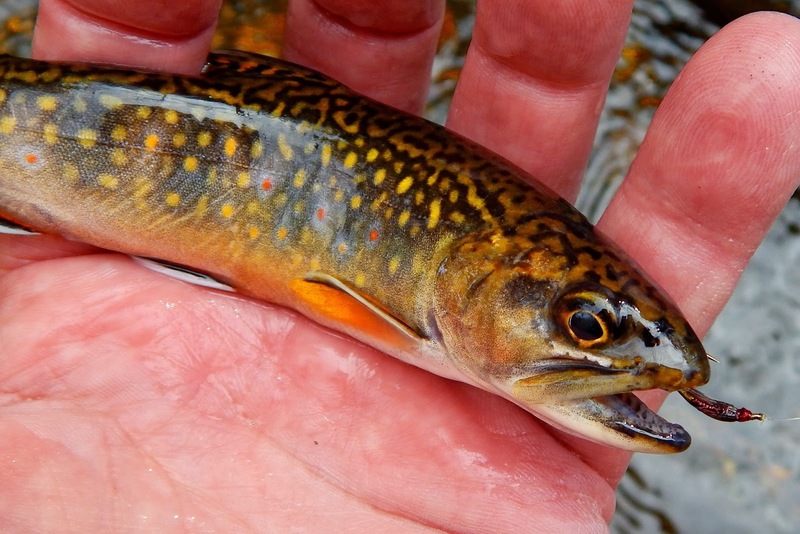 A wild brook trout taken from a small stream in November. One would need a large piece of paper two write the names of the colors on this fish. 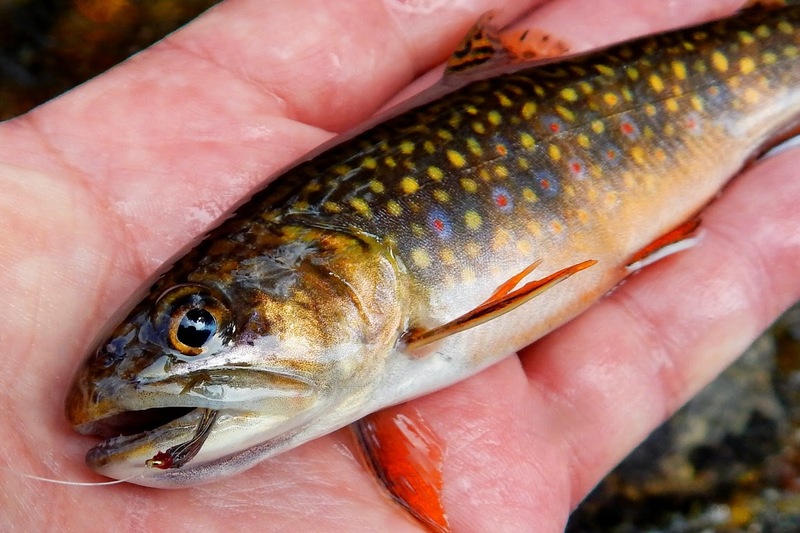 The flies below are tied with various colors taken from the brook trout. They are a tribute in feather,tinsel and silk to the "brookie". Small Stream Reflections is coming up on a milestone soon. These flies will be offered to celebrate that milestone. Some thoughts, plans, and a simple streamer. Good morning folks..........He's back. These last days have been what New England Spring is all about. Warm sunny days with temps near 70, streams in pristine condition, flowers sprouting, and even a trout or two rising to the dry fly. Well that changed rapidly last night. A cold front passed and this AM we were greeted with temps around 30, snow and a strong wind. But this is New England and it will change, the weather that is and all the winter crap will be gone. Saturday is the opening day of trout season in Connecticut. The major trout rivers, as well as lakes and ponds have been stocked and are waiting for the onslaught of fishermen. As for Mark and I and probably a few others we will not be there. We have decided to fish a few wild trout streams. These lovely little streams with those wonderful 5 inch wild trout. There will be no combat fishing here, and as Mark says, NO "white bucket" fishermen. Pristine wild trout water. A few wild jewels lurk here. Yesterday was a challenging as well as a rewarding day on the stream. Weather conditions were top notch for mid April. The water was just about perfect, and there were insects about. 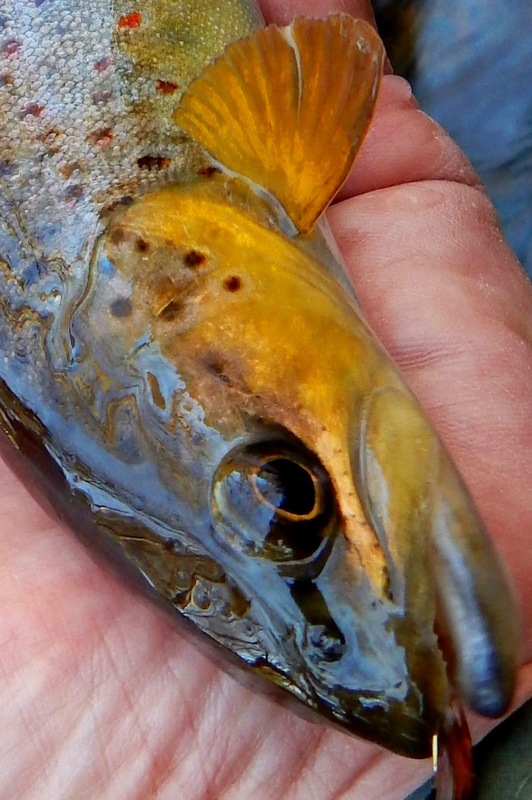 Kirk and I started fishing wet flies, but that changed and soon every pattern was fair game. I had tied on a very complicated, and extremely elegant dry fly with the hopes of taking my first trout on a dry for April. In a very promising looking pool I drifted the complicated, elegant dry fly along the riffle leading to the pool and "bam" a fish rose and missed. I continued to fish the riffle and the fish kept rising to this complicated, extremely elegant dry fly. At one point I believe he got pricked and was on, but that was not to be. I moved on down stream and Kirk moved into the riffle pool. He worked a Picket Pin through and suddenly I picked up a noise in the woods along the stream. It was Kirk, he could not believe the fish that whacked his fly. That fish is still there. We continued to fish, and I was not able to bring one to hand. Kirk on the other hand had a pretty good day for himself, he scored a brown, brookie and that special fish a wild Tiger, his first. I fished the dry fly for some time with trout rising to it. Finally the fly made its final hookup of the day. It succumbed to the root ball of a fine hemlock. So with time running out on this outing I worked a few last runs. I cast the fly and allowed it to drift to the bend just at the end of the fallen log. As I started to retrieve the fly the brookie struck, and my first and only fish was at hand. I had the pleasure of fishing a beautiful little stream on Thursday. The weather could not have been nicer. With air temps in the high fifties and a brilliant sun which made it feel so much warmer. The sparseness of the early April foliage and the clarity of the water made for some very slow stalking. Movement in a stealthy manner was the hot tip of the day. I started fishing wet flies and pretty much stayed with those through the outing. I was soon greeted by a feisty small brown at the very edge of a plunge pool, an odd place to find browns at this time of year. I continued my trek downstream and was rewarded with another small brown. There are places along this stream that are so well protected by nature, that they might never be fished. The thorns are of such size that they could be recorded as not of this earth. As I reached this nice run, a spot that has a prime undercut, I drifted the fly towards it. The fly was swinging through about mid stream when the fish hit. 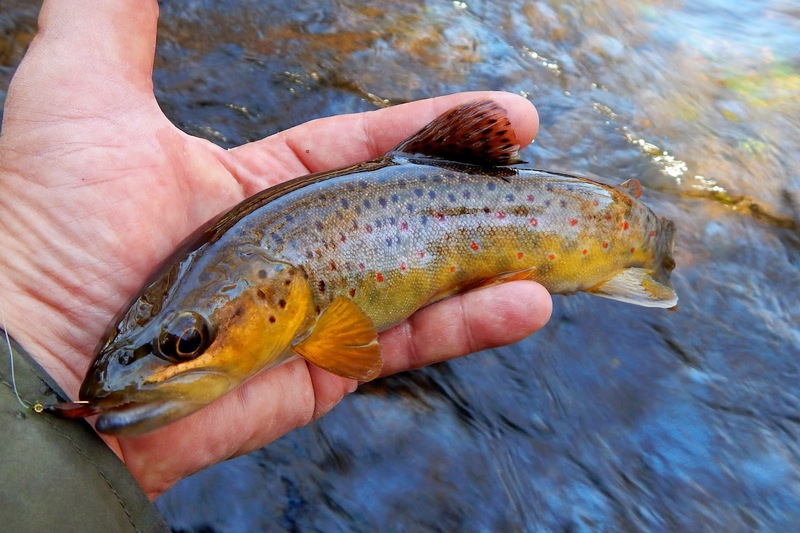 As I laid my hand in the water and lifted a fine female brown to photograph I realized it to was in a odd location also. A hen in prime condition. A sign that the condition of the stream during this winter was satisfactory. This section has always given up a nice brookie or two over the years. It's usually a mass of tangles and woody debris, but this time it was pretty open and very clear. I let the soft hackle drift to the clump of wood in the stream. I saw the fish come for the fly and back off. A few more casts later as the fly hung in the current he struck again. This fish had a lot of fight in it, even going airborne a time or two. In the end the 3wt won out. The prize of the day, a wild handsome healthy male brown, beautifully spotted and the color of gold. He was released into the clear stream and vanished. Last evening I had the pleasure of tying at the annual Connecticut Fly Fisherman's Association fly tyers roundtable. The event is held in East Hartford at the clubs meeting location. The evening started with a dinner provided by the CFFA to all who tied at the event. Then it was down to business of tying and meeting. There were many people in attendance. People I had the pleasure of finally meeting, after years of talking to on various forums as well as fellow bloggers, some of which made the trip from as far a Greenfield, Massachusetts. There were also some old buddies, those I have fished with and those who I will fish with. There were tyers crafting flies for salt water, fresh water, and salmon flies. And I believe everyone found something to their liking. I would like to thank the members of the CFFA for putting this function on and bringing fly tying to so many who attended. And thanks to all those who stopped by my table to watch me tie and talk for a spell. I appreciate it. These are a couple of patterns I tied at last nights function.